There’s nothing quite like a good, rare steak. I love ’em. I could eat ’em all the time. 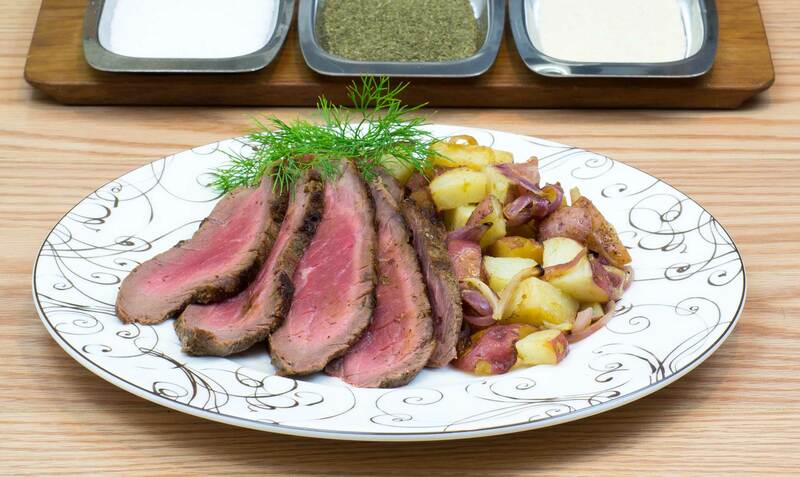 And, of all the ways you can prepare a steak, this dill steak rub has to be one of my favorites. Usually I use this rub on a thinner steak and then pan sear it in coconut oil. The great part about this is, not only does it cook quickly, and not only do you end up with a lot of flavor because you get more dill flavor per bite of steak, but you also get a pan full of drippings to pour over the steak after you slice it. And, take my word for it, that’s amazing. This rub also works pretty well for broiling. I haven’t yet tried it on the grill, but if you do, let me know how it turns out. I’d be interested to hear from you. This recipe, like all my recipes, isn’t an exact science. I tend to be a very “pinch of this, sprinkle of that” type of cook. So, I measured the ingredients out for you to get you a nice balanced rub, but feel free to add more or less of something to suit your tastes. Step 1: Pour ingredients in a small bowl and mix thoroughly. Step 2: Pat your steak dry and then rub the spice mixture onto the entire piece of steak. You want a pretty good coating, so if you don’t have enough to coat your entire steak, you’ll want to mix up a second batch. Step 3: Cook using your preferred method – pan seared in coconut oil and broiled both work very well.